The gospel for December 20 is from St Luke's 1:26-38. As I read it over this very familiar gospel, the song often sung at Christmas "Mary did you know?" came to mind. What actually did Mary know? I found a lot of answers today. Mary knew the Lord was with her. 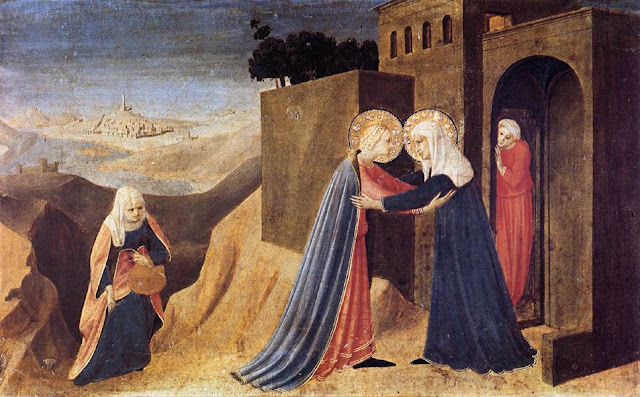 To Mary this greeting "full of grace" was troubling, so what did she do with what she knew? She pondered what sort of greeting this might be. 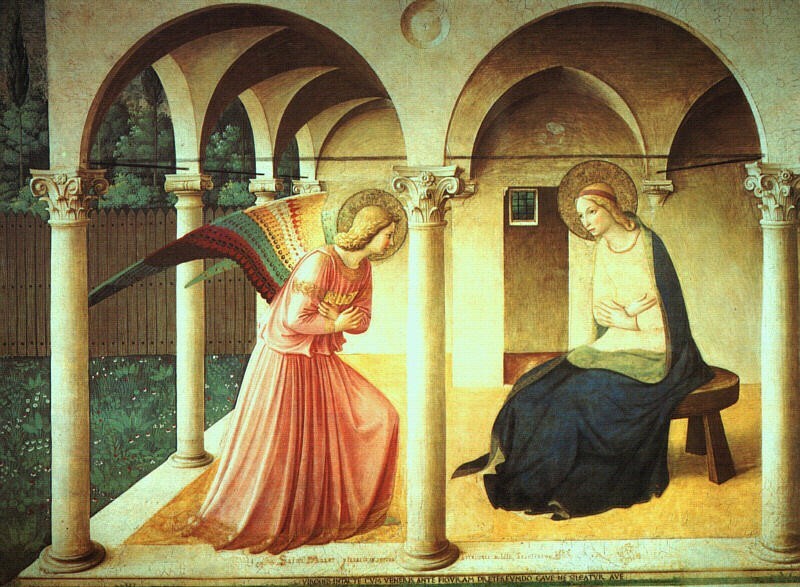 The Angel reassured Mary that she did not need to be afraid. This assumes she was afraid or had something to fear. Mary knew that people are not greeted by angels every day. Mary knew she had found favor with God and this could comfort any fear she felt. Mary knew she would conceive. She knew the child would be a boy. She knew is name -- it would be Jesus, meaning Savior. Even the name of the child revealed the future and His destiny. Mary knew she needed to catch her breath with all that the Angel is revealing, so she asks "How?" "How can this be?" Whenever we ask "how" the answer is always The Holy Spirit. The Holy Spirit will come upon her, the Holy Spirit overshadows, the Holy Spirit gives power, the power of God Himself. That's how, and Wow! Mary knew the child to be born will be called Holy. Holy means set apart. Mary knew the child to be born will be called Son of God- That's pretty specific. At this point, a LOT has been revealed to Mary, she has been flooded with the Angel's news. But almost as if to put an exclamation point on his message, Gabriel tells her one more thing as if to say "and I can prove it will happen": He tells her something else impossible that has already happened. "Elizabeth has conceived a son in her old age" "FOR NOTHING SHALL BE IMPOSSIBLE FOR GOD." Then the entire world and all the angels held their breath to await Mary's response to all she now knew. Mary knew she was only a handmaid, the lowest type of servant. Mary knew she lived in a small, unknown "backwater" town, Nazareth, Mary knew she was not married and she knew not man. But she said YES "Be it done to me according to your word." And Luke 1:39 which is not part of the gospel tells us all the more of what Mary did with all she knew. It wasn't enough just to know. Knowledge, with Love, looks for action. So Mary "set out" to go help Elizabeth. Luke 1:26-3826In the sixth month, the angel Gabriel was sent from God to a town of Galilee called Nazareth,27to a virgin betrothed to a man named Joseph, of the house of David, and the virgin’s name was Mary.28And coming to her, he said, “Hail, favored one! The Lord is with you.”29But she was greatly troubled at what was said and pondered what sort of greeting this might be.30Then the angel said to her, “Do not be afraid, Mary, for you have found favor with God.31Behold, you will conceive in your womb and bear a son, and you shall name him Jesus.32He will be great and will be called Son of the Most High,* and the Lord God will give him the throne of David his father,33and he will rule over the house of Jacob forever, and of his kingdom there will be no end.”34But Mary said to the angel, “How can this be, since I have no relations with a man?”*35And the angel said to her in reply, “The holy Spirit will come upon you, and the power of the Most High will overshadow you. Therefore the child to be born will be called holy, the Son of God.36And behold, Elizabeth, your relative, has also conceived a son in her old age, and this is the sixth month for her who was called barren;37for nothing will be impossible for God.”38Mary said, “Behold, I am the handmaid of the Lord. May it be done to me according to your word.” Then the angel departed from her. (1) The song "Mary did you know?" while beautiful, is theologically incorrect with the line "the child which you delivered, will soon delivery you." Mary was saved at her conception, in advance see CCC 491.
the way of the Lord." Advent is very short this year, in fact, it is the shortest Advent possible. 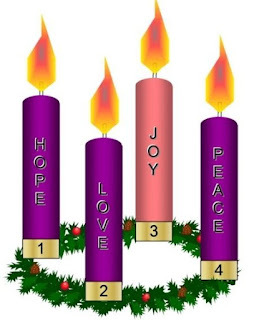 The Fourth Sunday of Advent is December 24, Christmas Eve. For quite some time, I've been wanting to hear Advent Songs during Advent. Grandma Got Run Over by a Reindeer just doesn't help me prepare for Christmas. So I spent the best $12 of the year creating my own Advent Playlist on my iPhone. https://focusoncampus.org/content/10-advent-songs-to-remind-you-its-not-yet-christmas This list by Matt Fradd pulls all the YouTube videos, so you could just enjoy the music of Advent this way. It's amazing how many versions of each song there are. Have fun choosing your own!